Black, Chocolate and Blue ducks – with white patches? White Patches on Ducks with Extended Black Genes are commonly seen as they age. 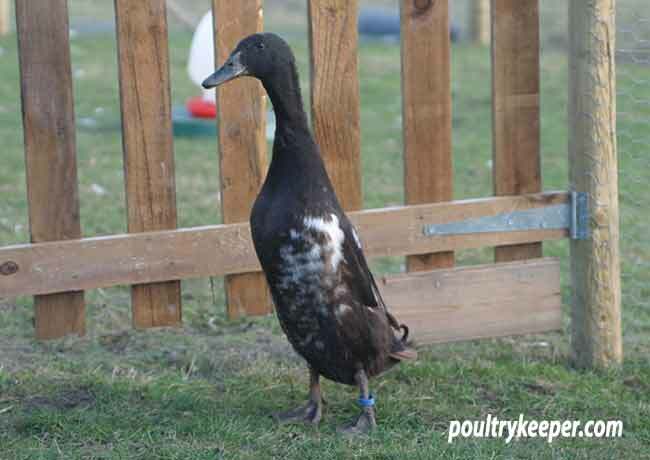 Pure Black, Chocolate or Blue coloured ducks will start off as the correct colour during their first year of life however, they will normally get white patches of down appearing that gradually get worse as they age. In the female duck, white patches are normal with age. No amount of breeding selection will remove this. After the first year, some small patches of white will start to appear and this will gradually get worse as they age until they are almost totally white. This happens with black / chocolate and blue ducks in other words all ducks that have the extended black genes. No amount of selection in breeding can stop this from happening. It is rare but drakes can also turn white after their first year, they should not be used for breeding if they do since it is actually classed as a fault.The Chocolate Indian Runner Duck pictured below on the left was pure chocolate until his first winter when he developed white patches and had to be removed from a breeding program.They still make fantastic pets and very useful bug exterminators even with white patches though! 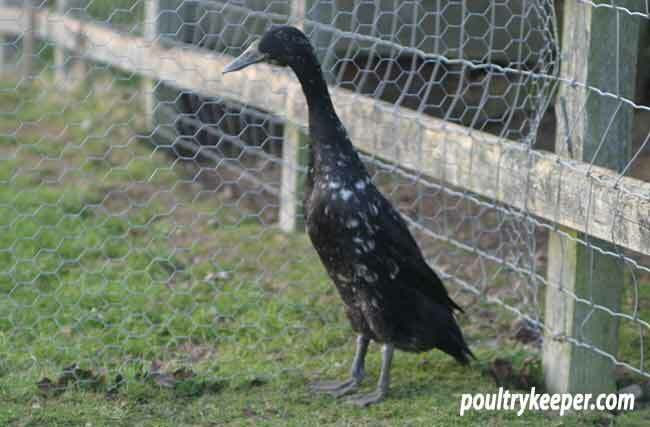 The Chocolate Indian Runner Drake is 1-year-old, The Black Indian Runner Duck shown at the top of this article is in her second year. Both were pure black in colour during their first year.